Drexel is leading a group of higher-educational institutions to study how experiential learning affects educational outcomes. Everyone talks about the value of hands-on experience, but how do you actually measure the impact of co-op programs, civic engagement, study abroad or undergraduate research? —N. John DiNardo, special advisor to the provost and a faculty fellow in Drexel’s Center for the Advancement of STEM Teaching and Learning Excellence. Schools across the country are hungry for data to evaluate how, when and for whom these different modes work best. In 2017, Drexel took the first steps toward studying the efficacy and impact of experiential learning in a rigorous way when it and two partner schools received a $40,000, two-year initial grant for a longitudinal, cross-institutional research project titled, “Tracking Experiential Learning Outcomes Across Three CAA Campuses.” This project seeks to track experiential learning outcomes across Drexel, the College of Charleston and the University of North Carolina-Wilmington. 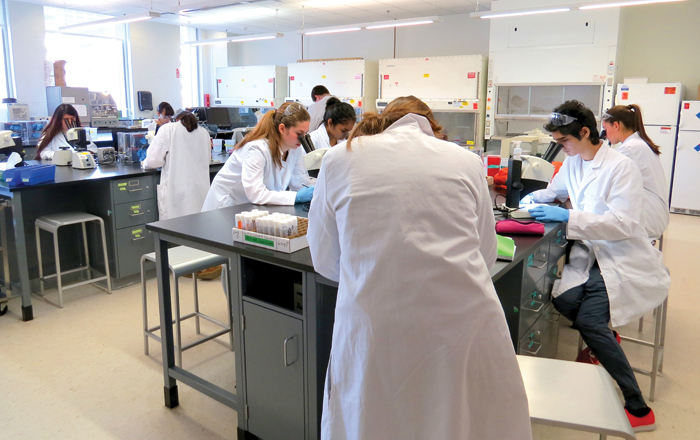 Biology students engaged in undergraduate research at Drexel.. The three schools aim to develop a single validated tool to collect data across a wide variety of experiential learning activities. This initiative will also establish a centralized hub of data that will grow over time, allowing deeper understanding of experiential learning outcomes in education. With a successful pilot established, the partners hope to eventually roll the instrument out nationwide.